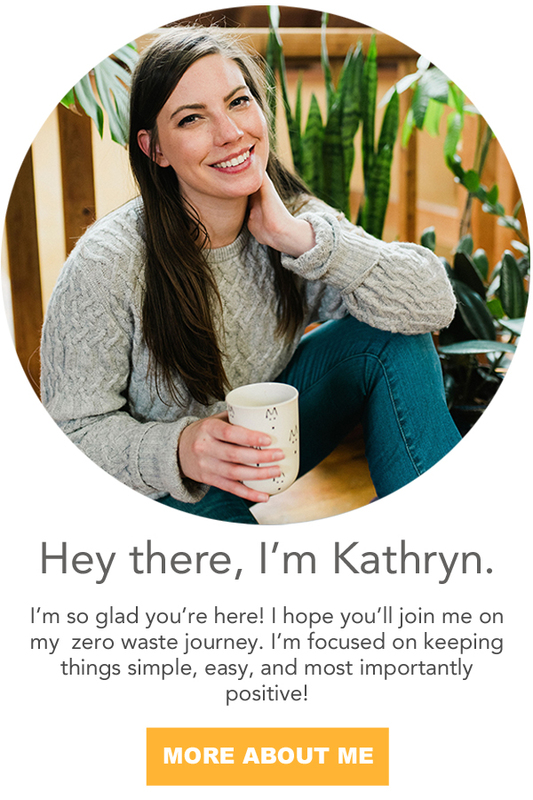 When looking to go zero waste, dip your toe into waste reduction, or being more eco-friendly, my first suggestion is always the Big Four! The Big Four are four simple, easy swaps popularized by Plastic Free July. These four items are easy to avoid and make-up a huge portion of waste in landfills and the ocean. All of these swaps are convenience items that are easy to avoid, and I'll show you how. The U.S. uses 100 billion plastic shopping bags each year, and it takes 12 million barrels of oil to make them. Bringing your own bags to the grocery store is pretty no brainer, but the tricky part is actually remembering them. I remember the first time I went to the grocery store after deciding to go zero waste, and I forgot my reusable bags. I had two options, I could either go home and get them or I could justify using plastic bags. I decided if I justified using the plastic bags, I would justify it in the future. I decided to go home and get them. I created a pain point, and I have to say I've never forgotten my bags since. If you forget your bags try and think through your patterns. Are there certain days you tend to go to the grocery store? Do you get groceries on foot? Could you buy bags that attach to your key ring*? Could you keep bags in your trunk? Just get in the habit of putting them back in your trunk after you take them out. If you forget, you can always ask for a box from the store room. Plastic water bottles are great for times of crisis. They're not so great if you have access to clean drinking water. 50 Billion plastic water bottles are consumed and disposed of each year. Since the recycling ban, none of these water bottles are recycled. Plastic in the ocean is piling up. 8 million tons of plastic is dumped in the ocean annually. We have to move away from this disposable, convenience based culture we've created. We've all become so busy, that we don't have time to fill up a water bottle? I know a lot of people don't particularly care for the taste of the tap water, and my suggestion is filtering it. Read this post if you're looking for a plastic-free way of filtering water. If you're always running late, and want to grab a bottle and go, buy a set of water bottles* and keep them in the fridge. You'll always have cold, filtered water ready to go. My favorite reusable bottles are glass and stainless steel* because they both have 100% recycle rate without loss of quality. If I have a small handbag, I like to slip in a stainless flask full of water. However, you might get some funny looks. Say no to single-use plastic straws! When you're out at a restaurant or bar ask for no straw in your drink order. If you like straws or drink a lot of smoothies that are difficult to drink from the rim of the glass go for a reusable straw. There are a lot of different types of reusable straws bamboo*, glass*, stainless*, and silicone*. They even have bendable ones*! Take away coffee cups might just be the bane of my existence. There are SO many alternatives... like sitting in the cafe and asking for it in a mug. It's so simple! Drinking your coffee in the shop, in a mug, is completely free. If you're in a rush, you can always ask for your coffee at a more drinkable temperature. If you want to grab your coffee to-go, think about brining along a thermos*. A lot of coffee shops will even give you a discount for BYO. Since, I carry a reusable water bottle with me most days, I like to carry a double insulated bottle*. It being double insulated keeps hot drinks hot and cold drinks cold. This way, I can grab a hot coffee or an iced coffee while out. I just pour out my water, typically in a nearby plant, and get my coffee to-go! Once I've consumed my coffee, I rinse my bottle out in a sink and then fill it with water. I think people assume that preventing waste and trash requires you to carry a lot of stuff with you, but that's just not true. All I typically carry with me is a water bottle. Of course having a bag to slip my water bottle into is really nice. My husband always carries a backpack, and it's really easy for him to tote along his water bottle too. If you're looking for more beginners tips make sure to check out these posts!